Mazda (Mazda motor Co., LTD), headquartered in Hiroshima, is a Japanese auto producer. The products are mainly sold to Asia, Europe and North America. As the most famous brand, Mazda is one of the fourth largest car manufacturers in Japan. In 2008 it ranked 255th in the fortune 500. 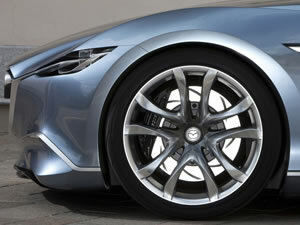 Mazda adopts the front wheel rim drive, former brake. And the brake is disc type. In addition, the hand brake is used too. The former tire size is 215/70 R17. The rear tire specification is 215/70 R17. The full size tyre can be available. Mazda wheel rim is made of steel. Wuxi Hengsheng Wheel Co., Ltd is a professional Mazda steel wheel rim manufacturer and supplier in China. In addition to Mazda steel wheel rim, we also provide other famous models steel wheels (rims) for our clients around the world, like Mercedes wheel (rim), Volkswagen wheels (rims), Mitsubishi wheel, NISSAN wheel, OLDSMOBILE wheel, PONTIAC wheel, SAAB wheel, Saturn wheel, Scion wheels, Subaru wheel, Suzuki wheel, Toyota wheel, Mini wheels (Mini rims), Volvo wheel, etc. We possess a professional technology team to guarantee the manufacturing of Mazda wheel rim. We will checkout all the products and give out a survey report. According to the needs of every client, there will be a dynamic balance sample survey among parts of the qualified Mazda wheel rim.